Not too long ago I did a post on the Automatic K-475. It uses a very rare Hamilton movement, the 17 jewel 690. There's another equally uncommon movement, the 25 jewel Hamilton 664. It was used in only two models, the 1957 Astramatic I and the Astramatic II. Based solely on sightings, I would say the Astramatic line is considerably rarer than the K-475. The K-475 was much less expensive and produced for two years. The Astramatic line was short lived... it was only produced for a single year. The Astramatic I came in a solid 18K yellow gold case. The Astramatic II came in a solid 14K yellow gold case. So both models were considerably more expensive than many of the contemporary Automatic K-models offered at the same time - or even the Rotomatic line with the 23 jewel Hamilton 665 movement. 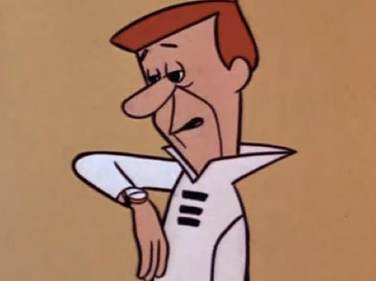 I really like the name too... reminds me of what George Jetson might have worn. I've yet to see an Astramatic I but I recently came upon an Astramatic II for sale. With a rare model like this, if you see it you had better buy it, as you may not see another for a while. 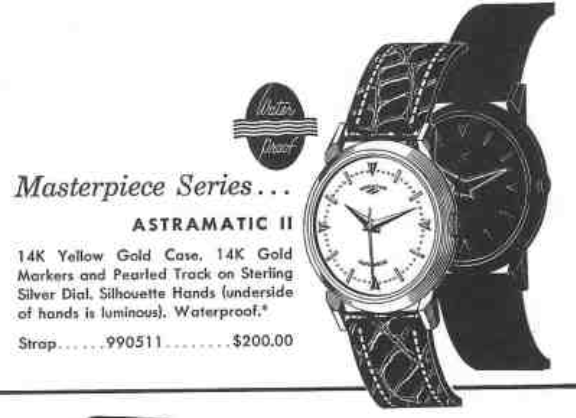 The Astramatic II was expensive. In fact, it was the most expensive 14K watch in the lineup. Like a couple of other models from the era, it featured "silhouette hands" where radium paint was applied to the back of the hands. The glow of the hands flowed onto the dial, creating a silhouette when it was dark. I'm sure it was very cool looking but after a few decades it can take it's toll on the dial. After a little back and forth with the seller we agreed on a price. The only concern I had with the watch was it was missing half of the marker at the 12 position. I don't see it under the crystal but maybe it's somewhere inside the case. You can see some spotting on the dial from the silhouette hands but it doesn't look too bad. The solid 14K back shows a couple of scratches from past attempts to open the case. Other than that it looks unremarkable - which is good. I see a couple of watchmaker's marks inside so I know I'm following in a couple of people's footsteps. The 664 looks just like the 661, 662, and the 665. The only difference is it has 8 extra jewels - all of which are related to supporting the automatic framework. Not only is the left side of the 12 marker missing, the 11 marker is lifted slightly off. You can see the two holes for the 12 marker and the post on the 11 marker that goes into it's hole. I just need to press the 11 marker back in place. In this shot you can see the radium paint on the back of the dauphine hands. That will come off in the ultrasonic. I'll see what I can do about cleaning the dial but I don't want to lose the printing so I will be extra careful. There are four red ruby jewels on the top of the framework and there are four more below. That's the extra 8 over the typical 17 on the 661 movement. This framework is also missing a screw. That's not a big deal though, I'll take one from a donor 661. Bushings are used on the 661 where the additional rubies are used on the 664. Bit by bit, piece by piece, parts are stripped from the back. While everything is being cleaned I will pull out my stash of old dials and look for potential replacements for the missing marker. Maybe I can use this 12 marker? That will change the look of the dial and the holes probably won't line up. The markers from an old Rodney dial might be a good option. You can see I've used this dial as a donor for markers before. Based on the holes at the 3 position, these markers won't fit the Astramatic dial. Well now... maybe this old Stormking III dial would work. The 12 marker is sort of the right shape and perhaps I can file it into a triangle and less of an arrow. Hold the phone... this 1957 K-203 dial has two triangular shaped markers that form a wedge shape at 12. I bet I can use the marker on the right. Everything is cleaned and dried. Time to put it all back together. The movement is back to running condition. It's off to the timer to listen to it's ticking. Not too shabby. There are a couple of extraneous dots to investigate but this watch is looking good otherwise. A new crystal is definitely in order and this 28.1mm high dome with do the trick. Nailed it! The K-203 donor saved the day and this Astramatic II is back to fully restored condition. I also replaced the crown, as the other was a bit worn down and wobbly. Paired with a fine genuine lizard strap, this Astramatic II is ready for wrist time. Here's another shot of the dial on an angle. My merciless light tent makes the center of the dial a little more toned than it appears in typical daylight. The radium is gone now so no more damage will be done.